Connecting Magento to Freestyle Solutions Multichannel Order Manager (also known as Dydacomp Multi Channel Order Manager / Mail Order Manager or MOM) has never been easier. Using the Magento MOM Integration by XTENTO, setting up a bidirectional connection between Magento and MOM is a breeze. Stop entering orders manually today! The integration will automatically sync all your new Magento orders into MOM every couple of minutes. This task can be started and disabled in MOM on demand. All details of an order, including customer details, the billing and shipping address, payment details, item details (including discounts) and custom options will be sent to MOM. Processing credit cards? You need to be PCI compliant. If you have to process credit cards, this integration does it in a PCI compliant way. MOM 8/9 in combination with an Authorize.net CIM compatible Magento payment gateway will only transfer the payment token and no actual credit card number to MOM in order to be PCI compliant. You can now capture payments in MOM. This gives you the flexibility to process imported orders just like if you entered the credit card physically into MOM. Let's be honest: Creating invoices, shipments and adding tracking numbers in Magento is an extremely time-consuming and annoying job, especially if you're processing more than a couple of orders every day. Using this part of the integration, the status and tracking number import will be completely automated - you won't have do anything manually in Magento anymore. Our software will send shipped orders from MOM to Magento, creates the invoice (optional), captures the payment (optional), creates the shipment for the order (optional), adds the tracking number, notifies the customer that their order has been invoiced/shipped (optional) and will set the order status to 'Complete'. Having the latest and most up-to-date inventory levels in your Magento store can be mission-critical, both for you, the store owner, as well as for your customers. Selling something not in stock will cause trouble and argue the customer, who might not return to purchase anything off you again. Using our integration, it is possible to prevent just this - the inventory levels will be synced into Magento using a cronjob automatically. Setting up products manually in Magento is a dreadful job. By adding the Product Synchronization feature to your integration, you will be able to upload your products from MOM into Magento 1 or Magento 2 on demand. The integration supports simple and configurable products and includes a certain list of product attributes that are sent from MOM to Magento out of the box. Does not support other product types, custom attributes, images or categories out of the box - please contact us before your purchase if you have special product setups or requirements. This integration is also compatible with M2ePro's Amazon/eBay integration. Using M2ePro's Amazon integration and our MOM integration, you're be able to import your Amazon/eBay orders into MOM. The M2ePro integration also comes with a lot more features compared to the official MOM Amazon module. How does XTENTO compare to other MOM integrations? This integration is compatible with every MOM version from 5.0 through version 10.x. Now compatible with MOM V9/V10 as well! Both the FoxPro as well as the SQL editions are supported. This product is also compatible with both the US as well as the UK version of MOM. 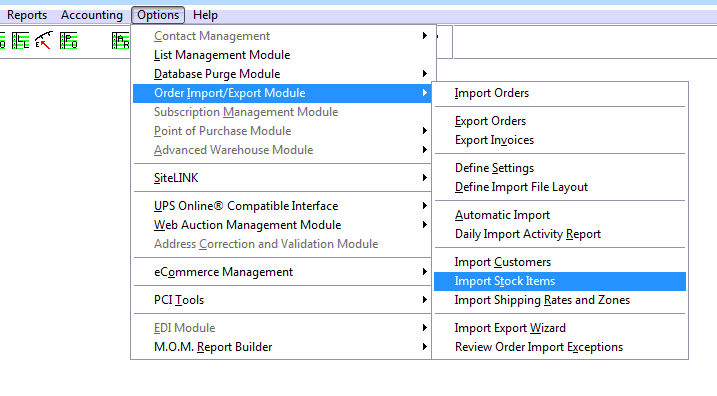 Please make sure your MOM version features the 'Order Import/Export Module' located at 'Options'. (See screenshot) Please note that restrictions with regards to the import flow may apply if the Multi-Company Controller Module (MCM) is installed and used in MOM. Important: Please make sure that your Magento webserver comes with support for the XSL PHP extension. To see if your server supports XSL, please download (save as a .php file) and run this file on your server or have a look at the phpinfo() output on your server to see if XSL support has been enabled. Out of the box a maximum of 50 products per order can be sent to MOM, this can be increased if required. The integration uses the FTP protocol to synchronize files. Thus, a FTP server must be running on the Magento server as well as FTP connections between the Magento server and the workstation must be possible. Your purchase includes free email support and updates for 6 months from the date of your purchase, at no extra cost. You can prolong your support and update period at discounted rates using the dropdown below. Also, renewing your support and update period after it has ended (for example two years later) is also possible at any time at just 25% of the product price.